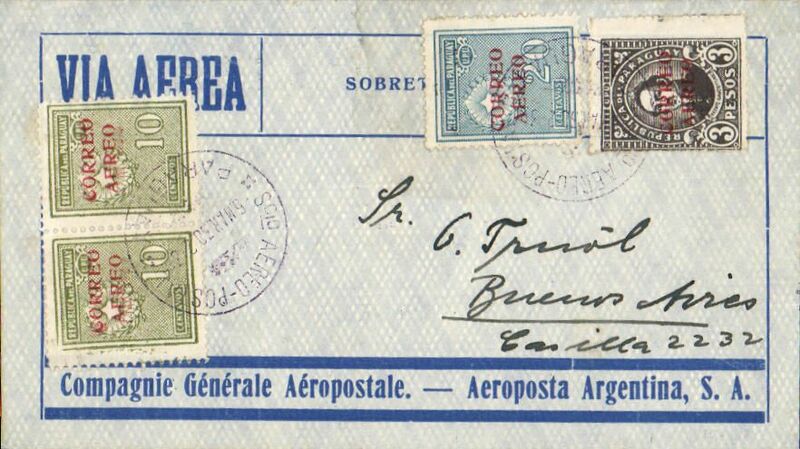 Ficarelli F/F Asuncion to Buenos Aires, bs Buenos Aires/via Aerea/2 Ene 29, franked $1.50 + $8.50 airmail, fine strike violet boxed "Correo Aereo/ Rep del Paraguay" cachet, Compagnie Aeroposta Argentina. 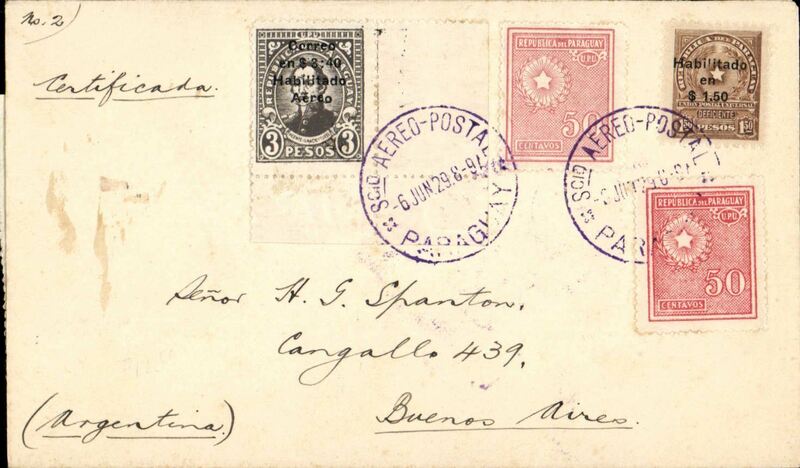 Ficarelli F/F Asuncion to Buenos Aires, bs Buenos Aires 2/1 and Gen Alvear 3/1, registered (label) cover addressed to a Notary (Escribano) franked $1.50 postage, $1.00 reg, and $5.65 airmail. Carried by rail from Buenos Aires to destination. Compagnie Aeroposta Argentina, Asuncion to Buenos Aires, bs 4/2, early commercial corner cover franked $5.35 inc $2.85 airmail opt with 'full stop' instead of 'colon' variety, carried on the C.A.A. 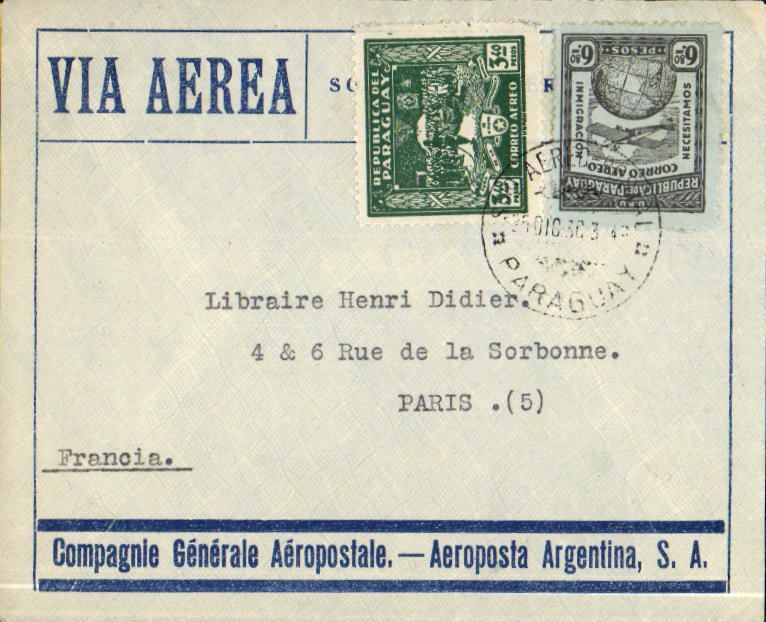 Asuncion-Buenos Aires service, fine strike blue boxed "Correo Aereo/ Rep del Paraguay" cachet used before airmail envelopes were introduced in 1930. 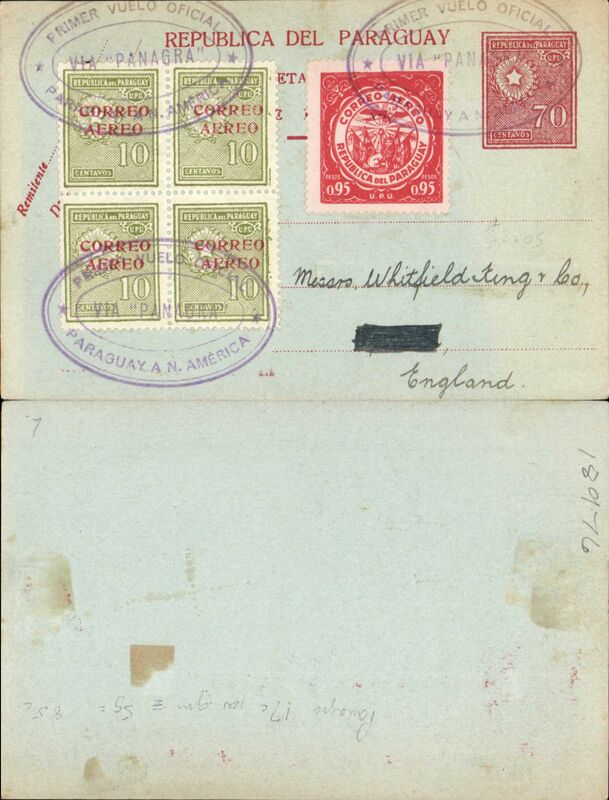 First acceptance of mail for England, Asuncion to London, bs 11/3, for carriage on the inaugural Compagnie Aeroposta Argentina Asuncion-Toulouse service, registered (label) cover franked $14.70 ($2.50 postage, $2.00 regn, $10.20 airmail), violet "Via Aerea" cachet, flown on the new CGA overseas service from Paraguay to Argentina then "accelerated" by the "plane-ship-plane route via the South Atlantic, arriving in Toulouse on 9th March. Scarce item in fine condition. 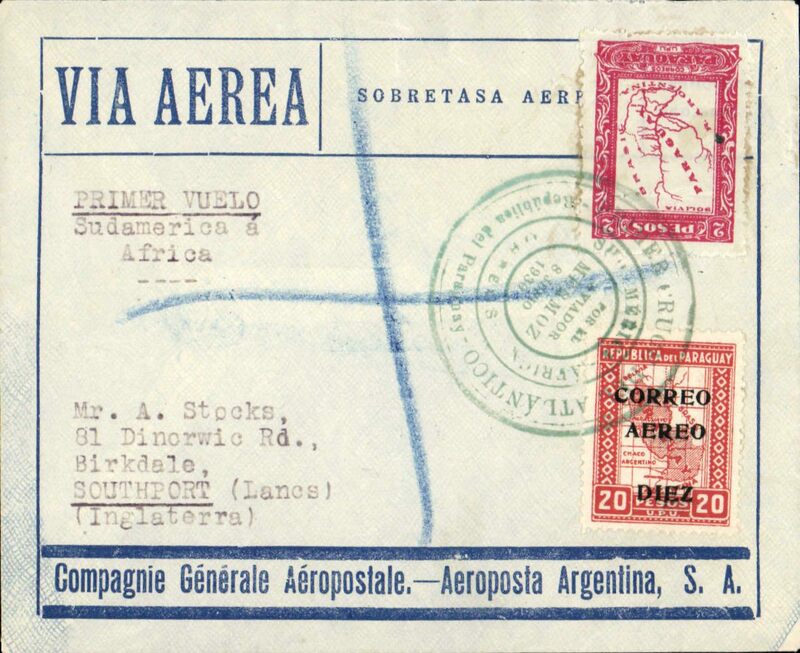 Compagnie Aeroposta Argentina, F/F regular Asuncion-Buenos Aires service, Asuncion to Hurlingham (Argentina) bs 11/4, via Buenos Aires bs 10/4, commercial corner cover franked $3 postage and $5.65 'carrier pigeon' airmail stamp, canc fine strike red Paraguay/Aereo Postal/9 Abr 29 cds, red framed 'Correo Aereo/Rep Paraguay' cachet used before airmail envelopes were introduced in 1930. Non invasive ironed vertical crease, does not detract. 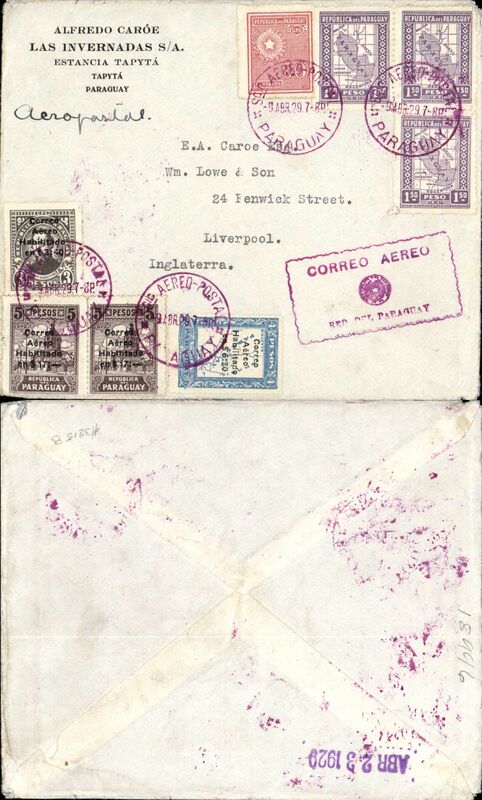 First acceptance of mail for England, Asuncion to Liverpool, for carriage on the first regular Compagnie Aeroposta Argentina service from Asuncion-Buenos Aires, commercial corner cover franked $5 postage and $44.20 airmail, canc fine strike red Paraguay/Aereo Postal/9 Abr 29 cds, red framed 'Correo Aereo/Rep Paraguay' cachet used before airmail envelopes were introduced in 1930, verso office hs Abr 23 1929, probably applied in Buenos Aires. 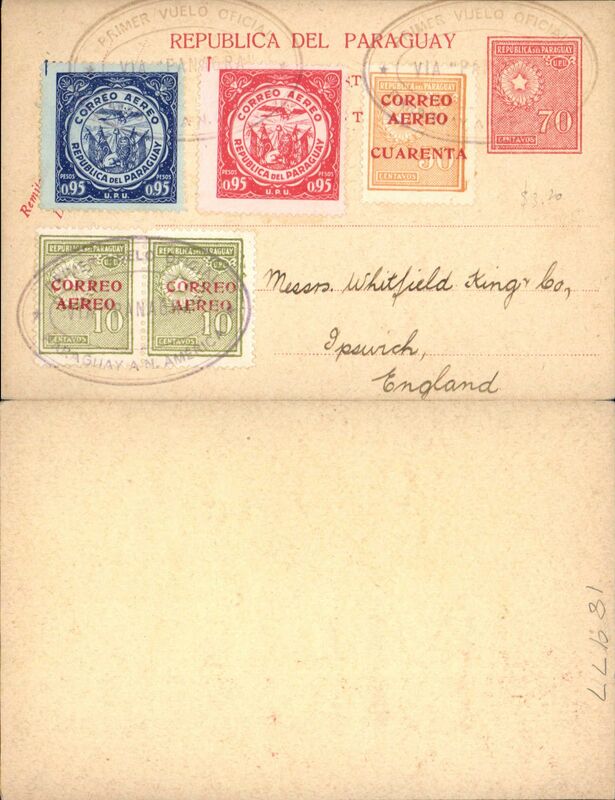 Asuncion to Buenos Aires, bs 10/5, flown on the Compagnie Aeroposta Argentina Asuncion-Buenos Aires service, registered (label) cover franked $30.20 inc 1929 C4,5,6 surcharge airs set, canc violet red 'Sco Aereo Postal/10 May 29/Paraguay' cds, fine strike violet boxed "Correo Aereo/ Rep del Paraguay" cachet used before airmail envelopes were introduced in 1930. The 1929 opt. set was issued for the first trans Atlantic service to Europe, and was withdrawn on 29 April 1929, so this could be one of the last days of usage. 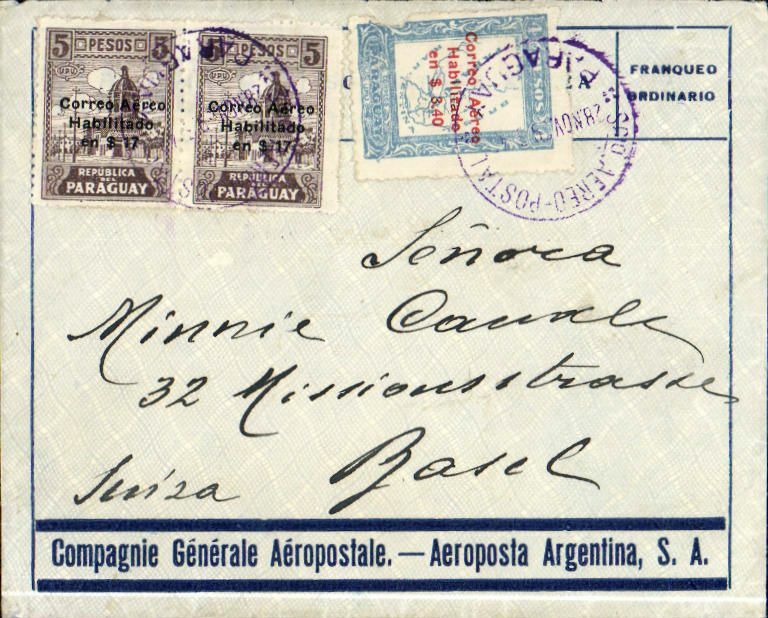 Asuncion to Buenos Aires, bs 7/6, flown on the Compagnie Aeroposta Argentina Asuncion-Buenos Aires service, registered (label) overpaid cover franked $1.50 postage, $1.00 registration and $3.40 airmail instead of $2.85, canc violet red 'Sco Aereo Postal/6Jun 29/Paraguay' cds, violet 'Certificados Exterior/Asuncion' clock face ds verso. The Feb 26, 1929 $3.40 issued to pay the airmail rate to Europe was used instead of $2.85. 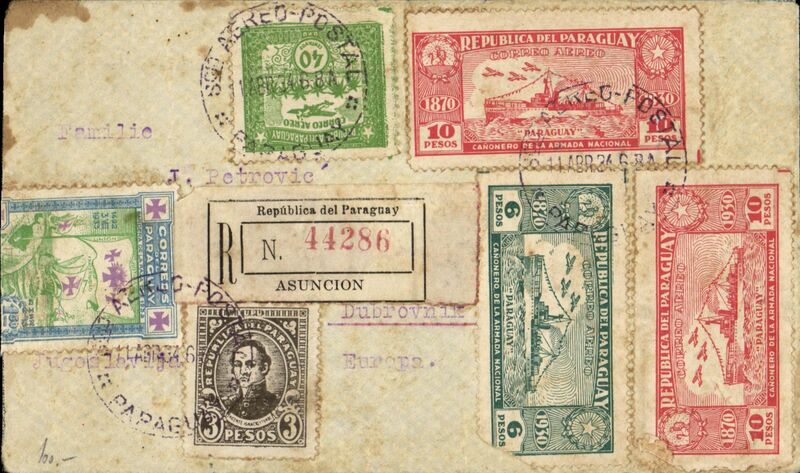 Paraguay-England, registered cover postmarked Asuncion (Paraguay) June 6, 1929 with arrival b/s Ipswich June 19th. 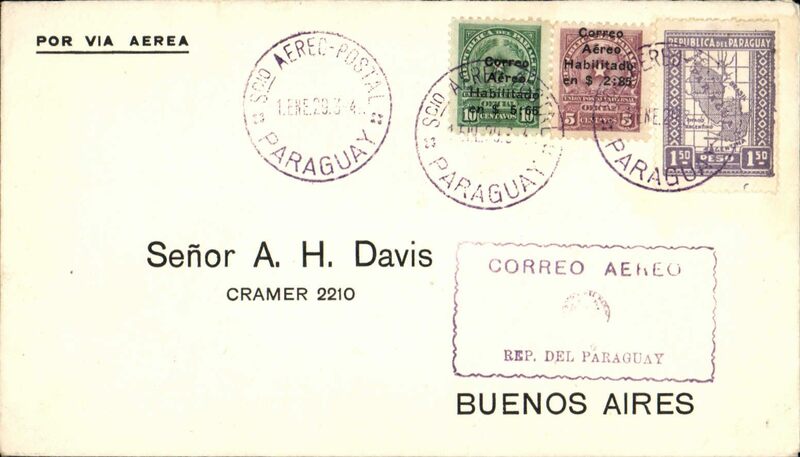 On the back, the boxed purple cachet “Correo Aereo Rep. Del Paraguay”. 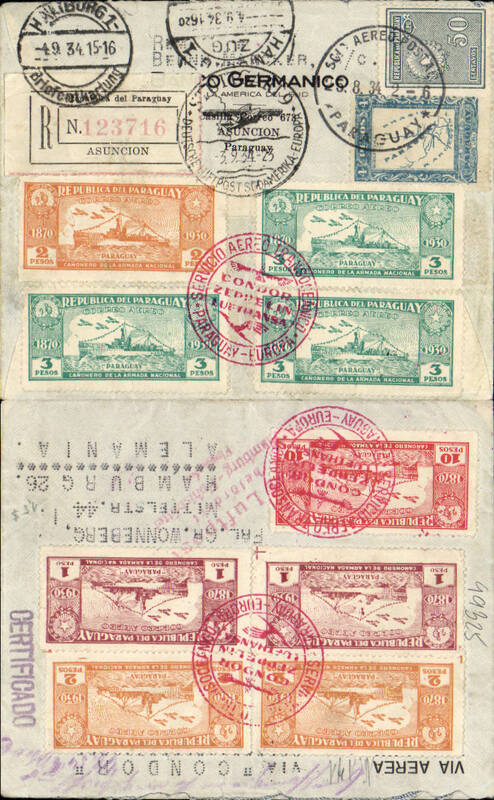 Franking includes nice copies of the first three airmail stamps Scott C1, C2 and C3. 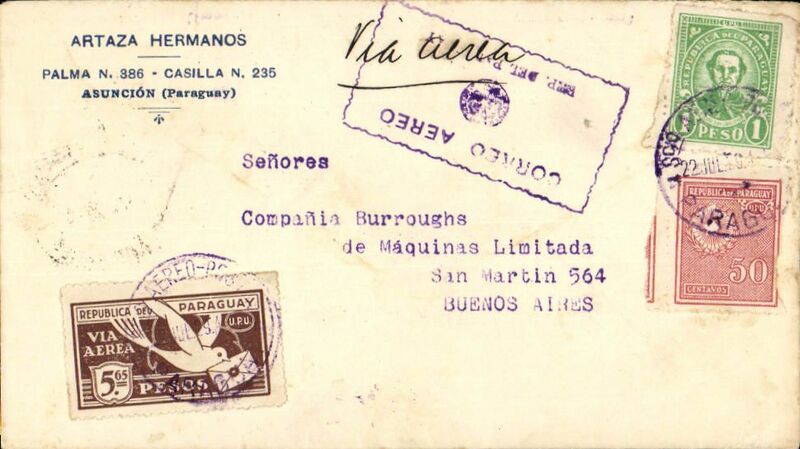 Paraguay to Argentina, bs Buenos Aires 23/7 and '1792' in box postman's mark, Hermanos corner cover franked 1P50 postage and 5P65 airmail rate using correct usage of the 5P65 'carrier pigeon' airmail stamp, ms Via Aereo, blue boxed "Correo Aereo/ Rep del Paraguay" cachet used before airmail envelopes were introduced in 1930. Asuncion to Switzerland, no arrival ds, carried on the inaugural Compagnie Aeroposta Argentina Asuncion-Toulouse service, "Lineas Internas y Linea Asuncion-Bs Aires Aeroposta Argentina" airmail cover franked $19.50, verso fine strike violet boxed "Correo Aereo/ Rep del Paraguay" cachet used before airmail envelopes were introduced in 1930, flown on the new CGA overseas service from Paraguay to Argentina then "accelerated" by the "plane-ship-plane route via the South Atlantic to Toulouse, then OAT to destination. Company cover in fine condition. 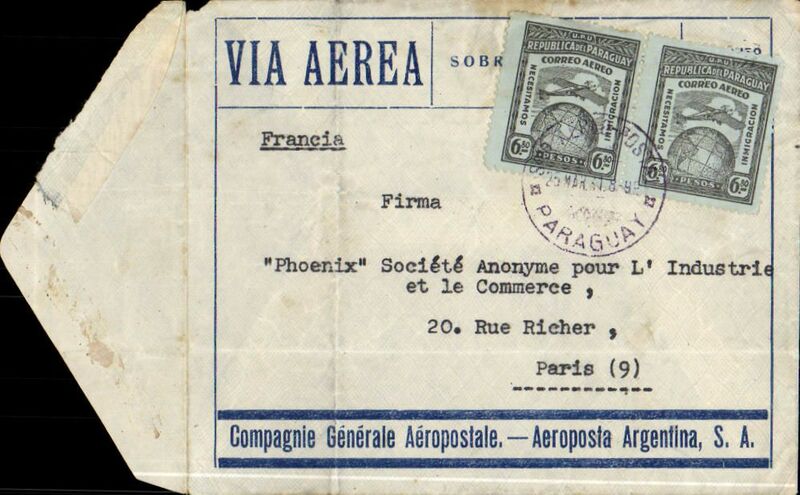 Asuncion to Paris, bs 30/9, blue/grey Aeroposta Argentina airmail cover underfranked franked 9P, 30c French postage due tied by black "t" in triangle tax mark, violet boxed "Correo Aereo/ Rep del Paraguay" cachet verso (used before airmail envelopes were introduced in 1930). Flown on the new CGA overseas service from Paraguay to Argentina then "accelerated" by the "plane-ship-plane route via the South Atlantic to Toulouse, then OAT to destination. A little rough opening along top edge. 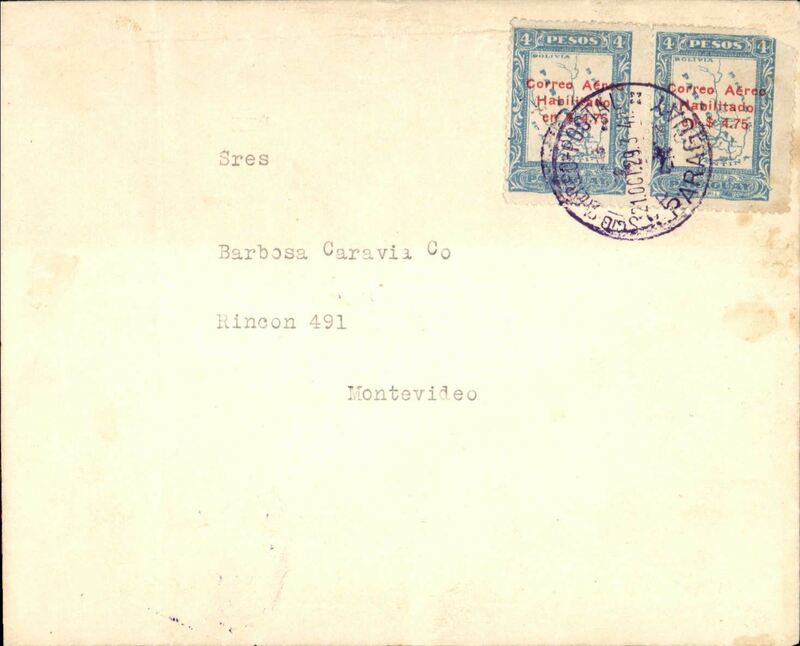 CAA/GGA, early flown cover, Asuncion to Montevideo, no arrival ds, plain cover, franked 1929 $4.75/$4 air, canc Sco Aereo Postal/21 Oct 29/Paraguay', verso fine strike violet boxed "Correo Aereo/ Rep del Paraguay" cachet used before airmail envelopes were introduced in 1930. Flown Asuncion-Buenos Aiures by Compagnie Aeroposta Argentina, and BA-Monte Video by Compagnie Generale Aeropostale. Uruguay is a more unusual destination. 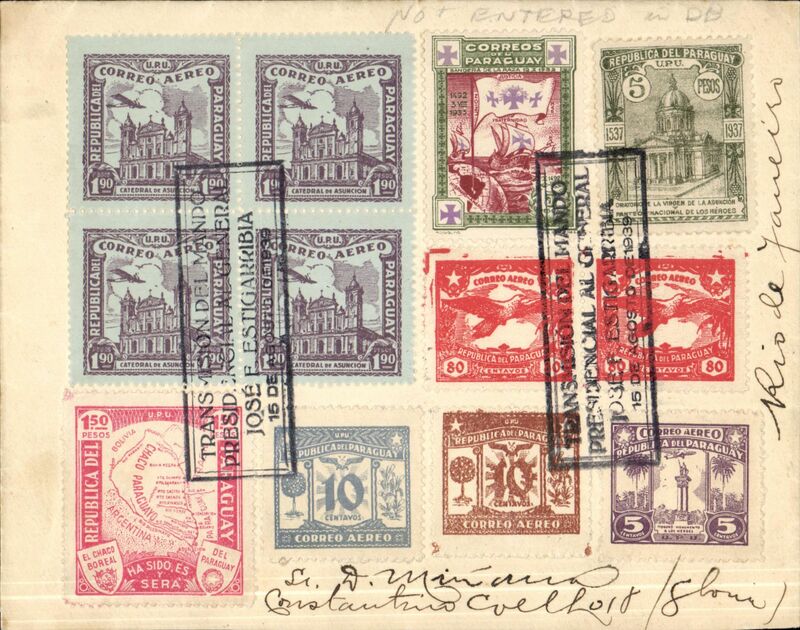 Asuncion to Basel, Switzerland, bs 18/11, registered (label) blue/grey Aeroposta Argentina airmail cover rated 34P for 10g weight + 2P registration, postage/air fee paid with an unseparated pair of 17P on 5P postage stamps, violet Asuncion 'clock' depart postmark verso. It is unusual to find pairs like this. 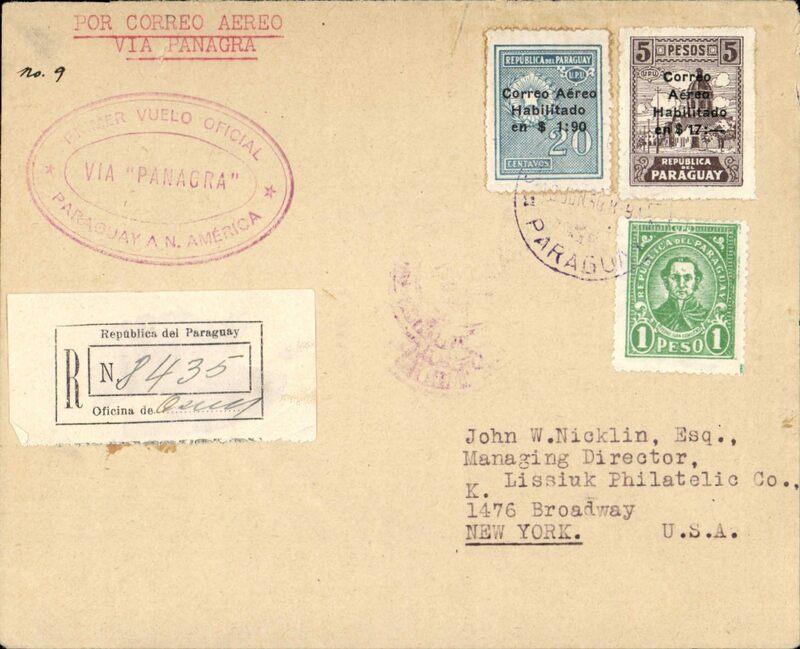 Also violet boxed "Correo Aereo/ Rep del Paraguay" cachet used before airmail envelopes were introduced in 1930. Flown on the new CGA overseas service from Paraguay to Argentina then "accelerated" by the "plane-ship-plane route via the South Atlantic to Toulouse, then OAT to destination. 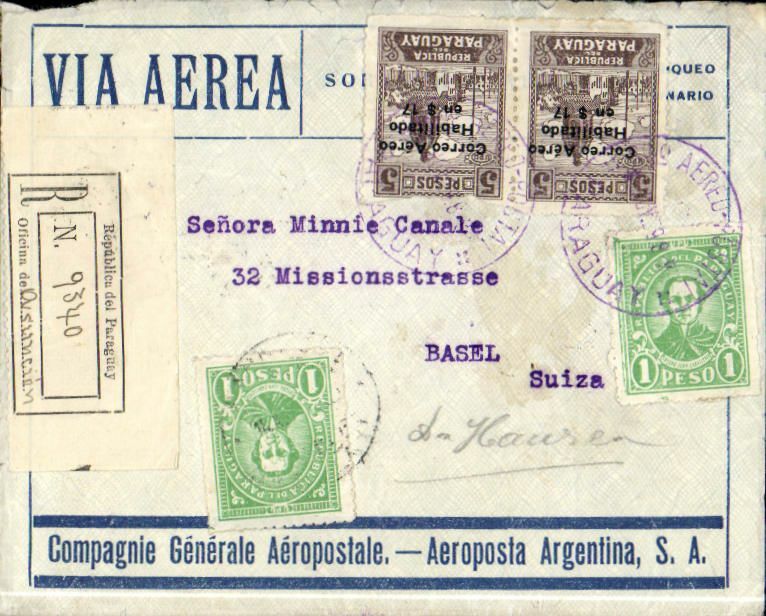 Asuncion to Basel, Switzerland, no arrival ds, blue/grey Aeroposta Argentina airmail cover rated 34P40 for 11g weight, air fee paid with an unseparated pair of 17P on 5P postage stamps. It is unusual to find pairs like this. 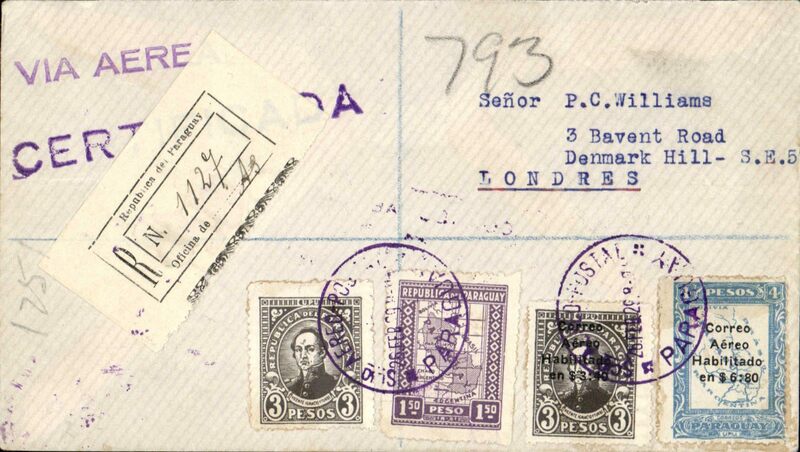 Also violet boxed "Correo Aereo/ Rep del Paraguay" cachet used before airmail envelopes were introduced in 1930. Flown on the new CGA overseas service from Paraguay to Argentina then "accelerated" by the "plane-ship-plane route via the South Atlantic to Toulouse, then OAT to destination. Asuncion to Paris, no arrival ds, registered (label) blue/grey Aeroposta Argentina plain cover rated 18P90 airmail and 2P50 registration. 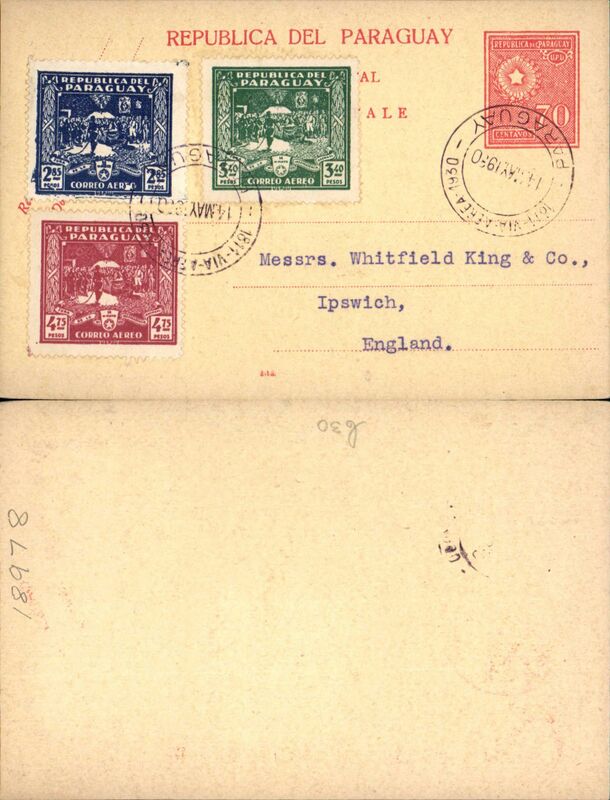 The cover weighed between 4 and 5 grams effecting a combined postage/airmail rate of 17P. Overpaid by 1P909 to include FDI of two pairs of the Cathedral of Asuncion' issue. Flown on the new CGA overseas service from Paraguay to Argentina then "accelerated" by the "plane-ship-plane route via the South Atlantic to Toulouse, then OAT to destination. 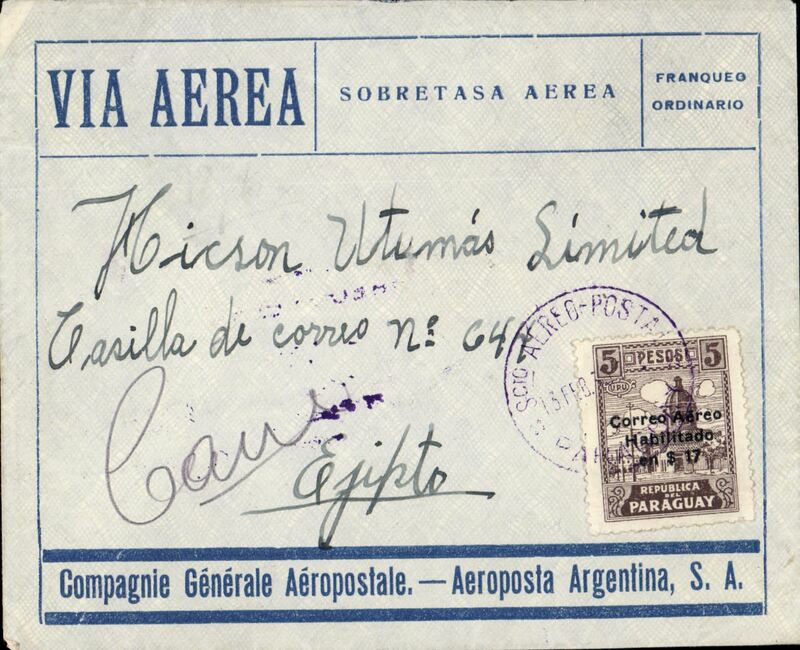 Asuncion to Buenos Aires, bs 7/3, blue/grey CGA Aeroposta Argentina SA envelope franked 3P40, verso violet boxed "Correo Aereo/ Rep del Paraguay" cachet used before airmail envelopes were introduced later in 1930..
Asuncion to Buenos Aires, bs 30/4, and small framed '1346' BA postman's mark, blue/grey CGA Aeroposta Argentina SA envelope franked 2P85 air stamp to cover postage and airmail rate (this is late use of the 2P85 air stamp issued on 2/3/29), violet boxed "Correo Aereo/ Rep del Paraguay" cachet verso, used before airmail envelopes were introduced later in 1930..
1928, 70 centavos unaddressed red/yellow postal card, with added 10c 'Correo Aereo' opts x4 and 1929 95c red air, all tied by three fine strikes dark green circular Mermoz "Premier Cruce del Atlantico/Por el Aviador/Mermoz/8 Junio/1930" cachets. Uncommon. 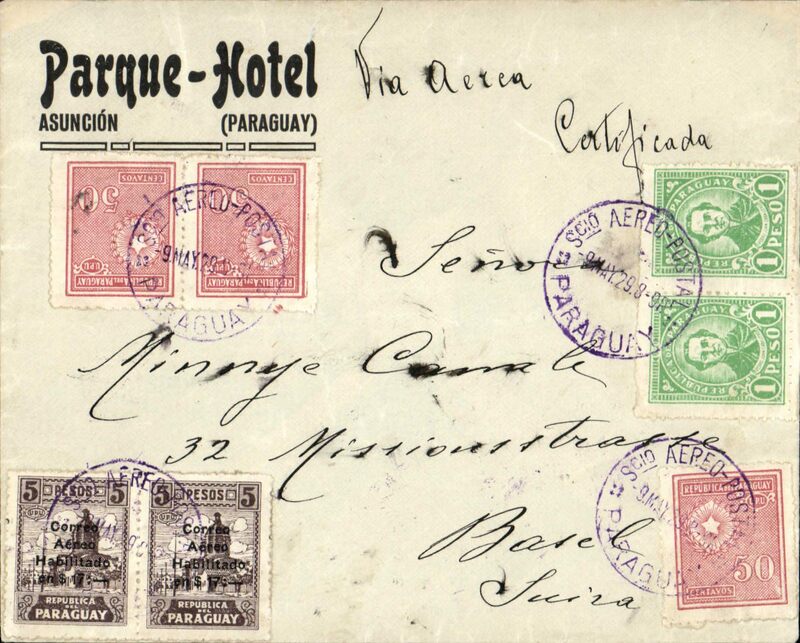 Asuncion to Basle, Switzerland, bs 20/5, via Lyon Gare 20/5, flown on the Compagnie Aeroposta Argentina Asuncion-Toulouse service, registered (label) 'Parque Hotel' cover franked $1 postage, $2.50 registration and $34 airmail, vanc violet 'Scio Aereo Postal/9 May 29/Paraguay' cdcs, fine strike violet boxed "Correo Aereo/ Rep del Paraguay" cachet used before airmail envelopes were introduced in 1930, flown CGA from Paraguay to Argentina then "accelerated" by the "plane-ship-plane route via the South Atlantic. Nice item in fine condition. 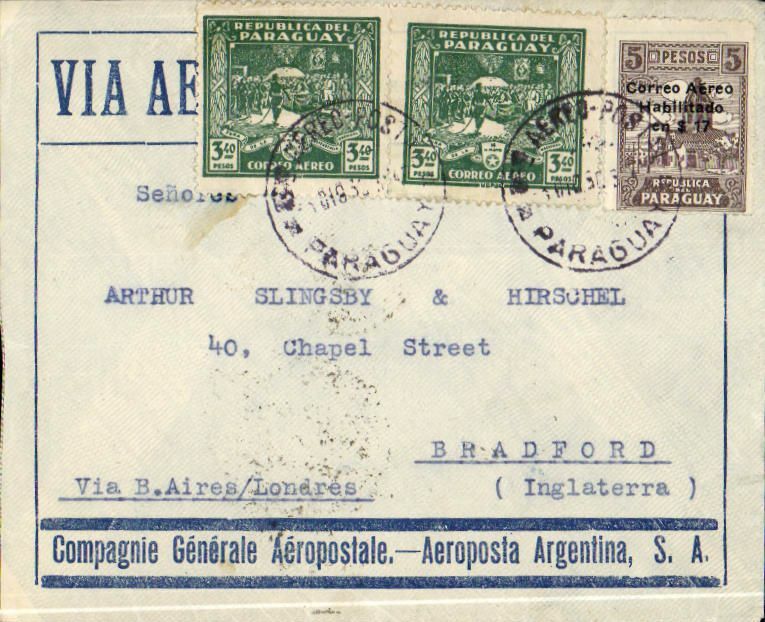 First acceptance of mail from Paraguay for carriage on the F/F Compagnie Aeroposta Asuncion-Buenos Aires service, then OAT to Cristobal, bs 19/6, on one of the regular Panagra mail flights from Buenos Aires, then OAT to New York, bs 21/6, on US internal air service, registered (label) air cover franked $1.00 registration and $18.90 airmail, canc Correo Aereo/Paraguay 12/6, fine strike red oval "Primer Vuelo Official/Paraguay a N. America" cachet, typed 'Por Correo Aereo/Via Panagra', Compagnie Aeroposta Argentina/Panagra. Scarce early item. 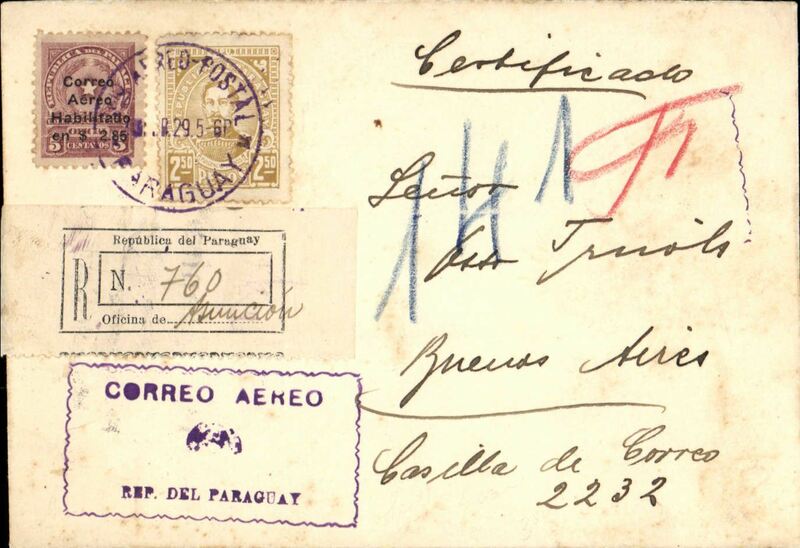 1928, 70 centavos unaddressed red/yellow postal card, with added 10c 'Correo Aereo' opts x4 and 1929 95c red air, all tied by three fine strikes violet oval "Premier Vuelo Official/Via Panagra/Paraguay a N. America" cachets. Uncommon. 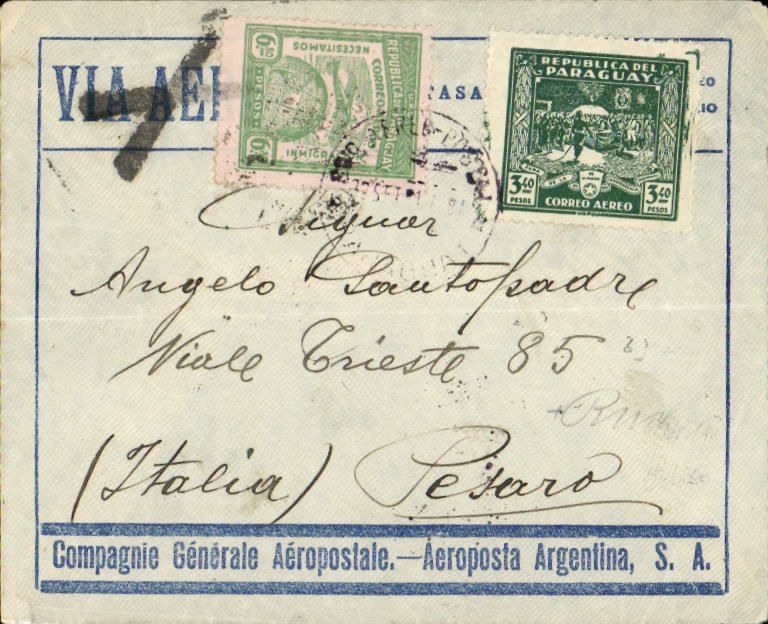 1928, 70 centavos unaddressed red/yellow postal card, with added 10c 'Correo Aereo' opts x4, 50c 'Correo Aereo' opt and 1929 95c red and blue airs, all tied by three fine strikes violet oval "Premier Vuelo Official/Via Panagra/Paraguay a N. America" cachets. Uncommon. 1928, 70 centavos unaddressed red/yellow postal card, with added 1930 Declaration of Independance air set of three, postmarked on FDI with fine strikes "1811-Via Aerea-1930/14 May 1930/Paraguay" cds's. Uncommon. Asuncion to Washington, DC, no arrival ds, blue/grey CGA - Aeroposta Argentina SA envelope franked 2P85 for Asuncion-Buenos Aires leg, and 13P60 for BA to US leg. The absence of transit marks suggests NYRBA to Miami and onward by US internal airmail system. 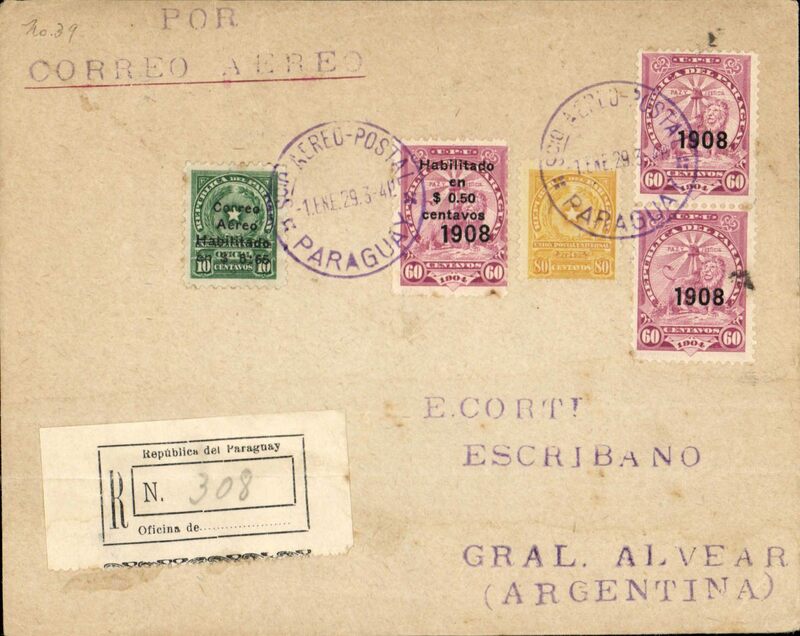 Violet boxed "Correo Aereo/ Rep del Paraguay" cachet verso, used before airmail envelopes were introduced later in 1930. In particularly fine condition. 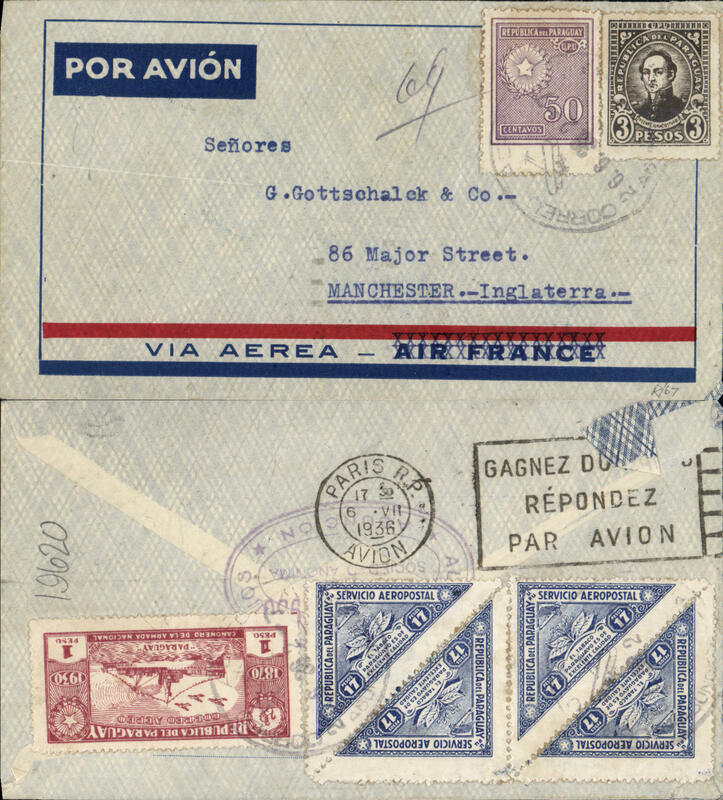 Asuncion to England, via Paris 15/12, 7x rated blue/grey CGA - Aeroposta Argentina SA envelope franked 23P80 (3P40 x7). 3P40 was the combned postage/airmail rate for Europe. 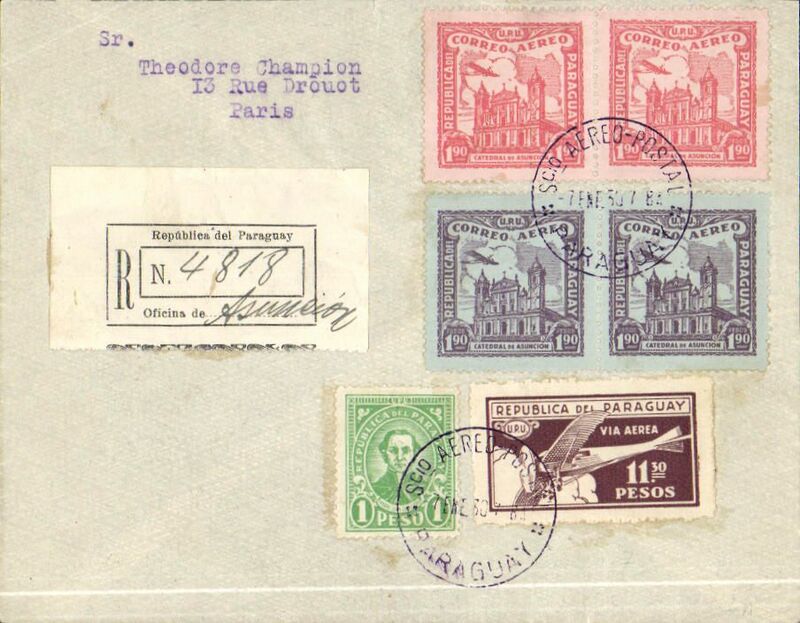 Asuncion to Paris, no arrival ds, triple rated blue/grey CGA - Aeroposta Argentina SA envelope franked 10P20 (3x 3P40) . 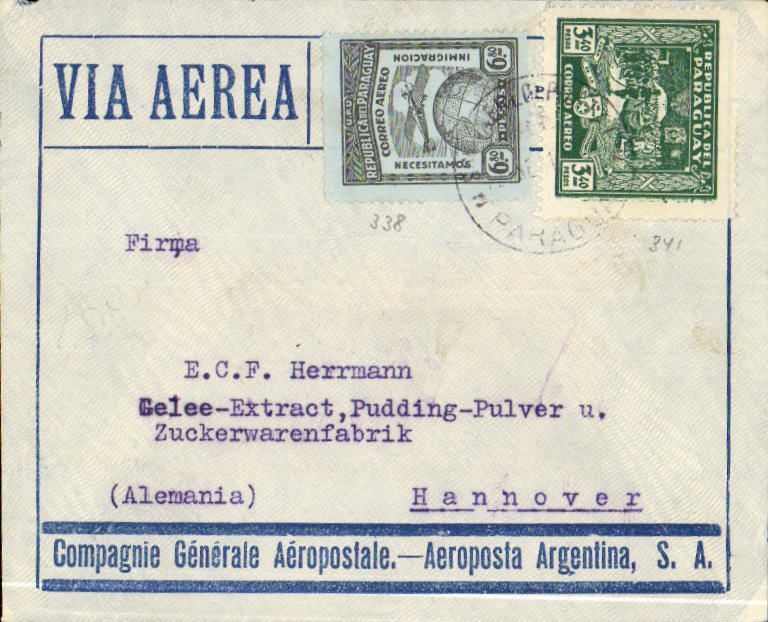 Asuncion to Hannover, Germany, no arrival ds, blue/grey CGA/Aeroposta Argentina cover franked 10.20, carried on the Compagnie Aeroposta Argentina Asuncion-Toulouse service. Flown on the CGA overseas service from Paraguay to Argentina then "accelerated" by the "plane-ship-plane route via the South Atlantic to Toulouse, then OAT to destination. Asuncion to Rio de Janero, bs 28/2, printed matter rated red/blue/grey airmail cover franked 850 (5P65 + 2P85). 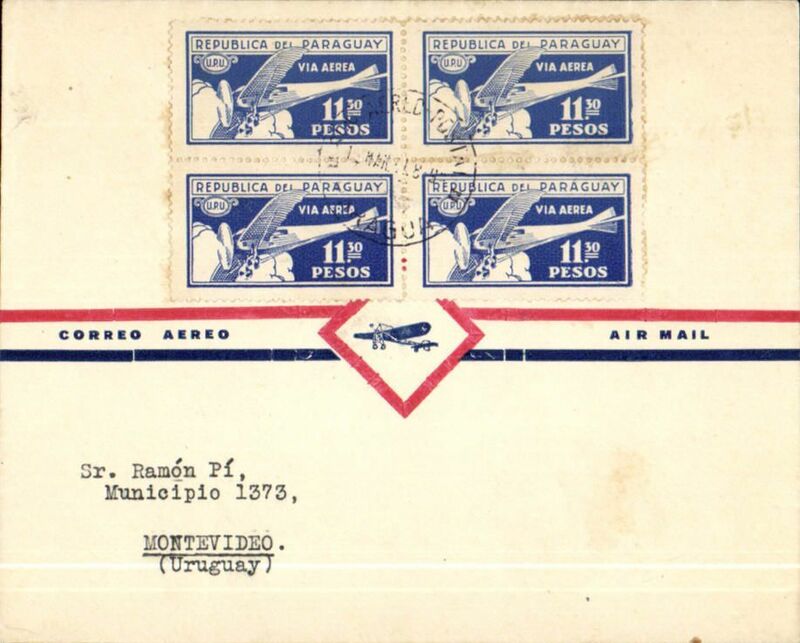 Paraguay to Uruguay, bs Montevideo 14/3, attractive and uncommon red/white/blue airmail cover franked 1929 blue/white 11.30P air block of 4. 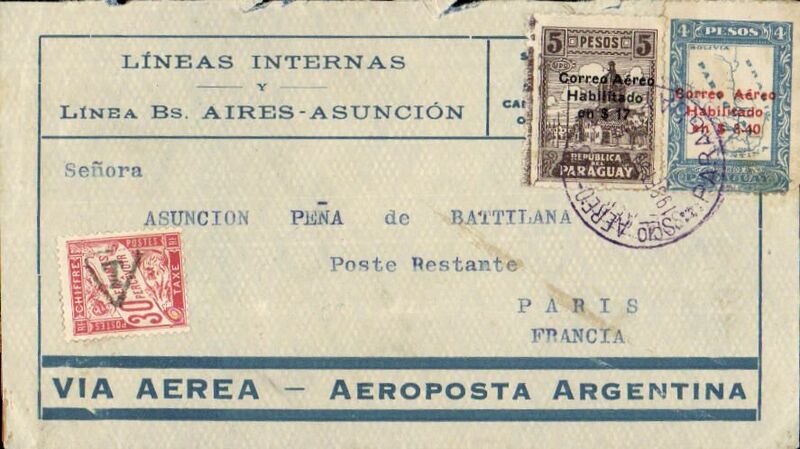 Asuncion to Paris, bs 7/4, blue/grey CGA/Aeroposta Argentina cover franked $13.60 for 4g weight (4x$3.40), canc SA Aeroposta cds, carried on the Compagnie Aeroposta Argentina Asuncion-Toulouse service. Flown on the CGA overseas service from Paraguay to Argentina then "accelerated" by the "plane-ship-plane route via the South Atlantic to Toulouse, then OAT to destination. 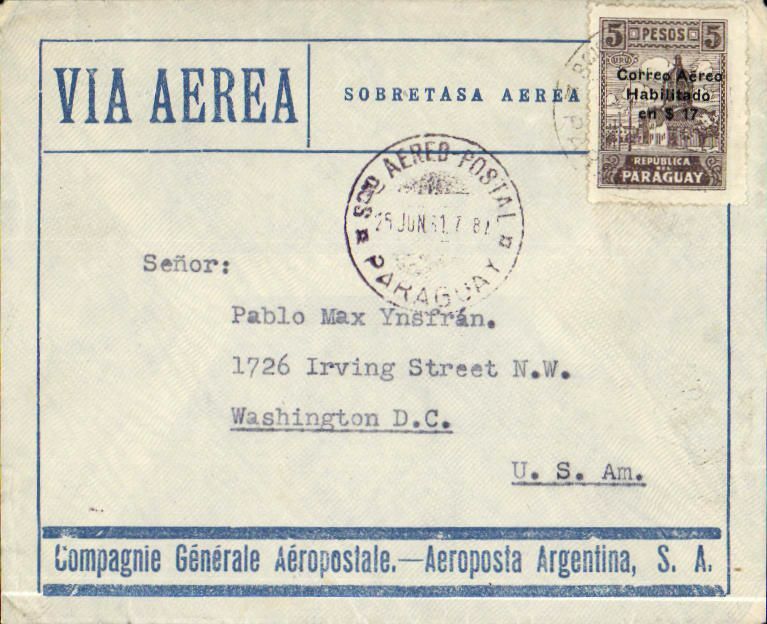 Asuncion to Washington, no arrival ds, blue/grey CGA/Aeroposta Argentina cover franked $17.00 (5X $3.40). CGA went into liquidation on 31/3/31. 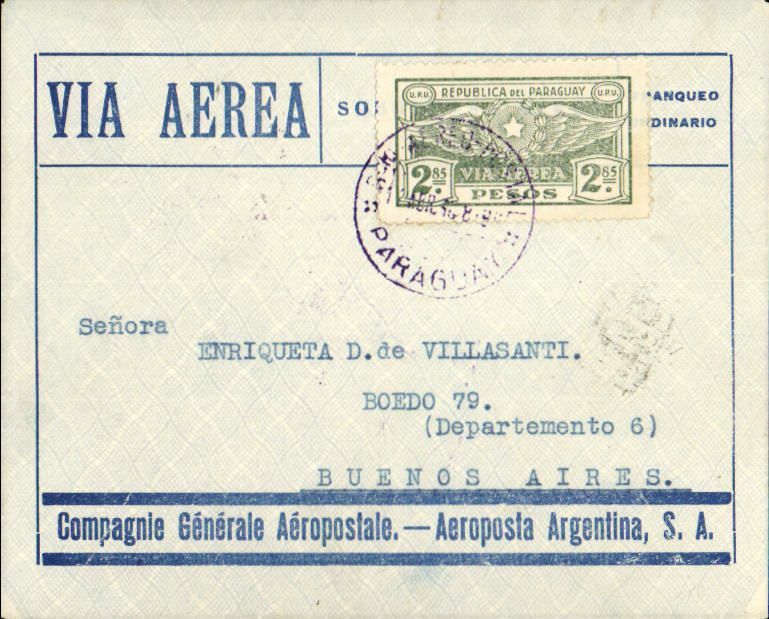 This cover was carried on the surviving Asuncion-Buenos Aires route with support from the Argentine PO. Interesting item. 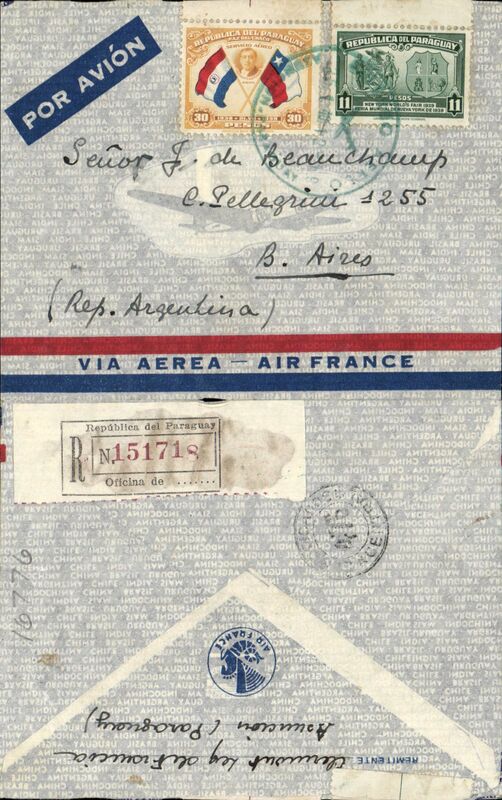 Asuncion to Pesaro, Italy, no arrival ds, blue/grey CGA Aeroposta Argentina SA envelope franked 9P40, 'Via Aerea' cancelled by Marseilles black cross Jusqu'a, confirming carriage by Air France. 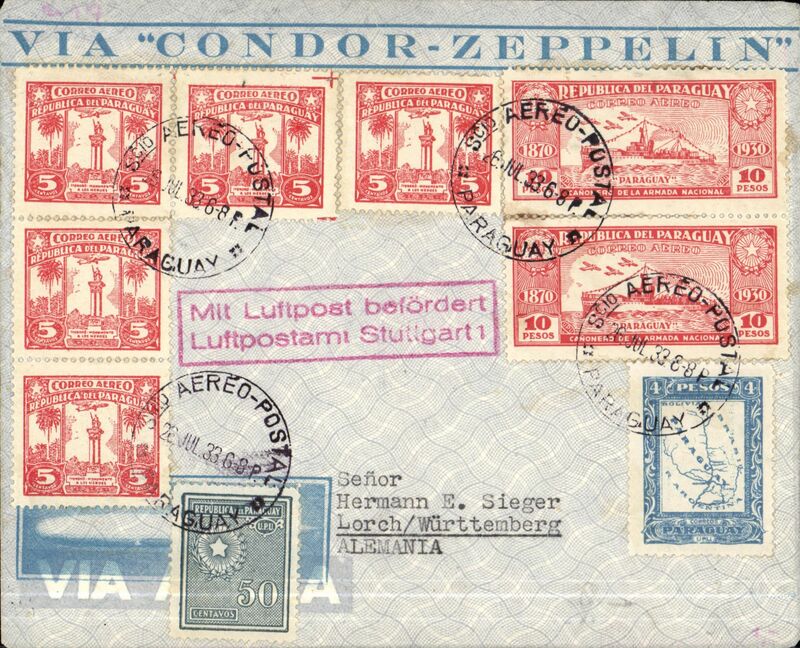 Registered pre-printed Condor-Zeppelin cover postmarked Asuncion (Paraguay) July 26, 1933 addressed to Lorch (Germany) with arrival b/s August 8th and transit b/s Paris August 7th and Stuttgart August 8th. Interesting use of a Zeppelin envelope for a cover with obviously travelled by Aeropostale. Nice clean cover with attractive franking including C49 (2 copies) and C58 (5 copies). Paraguay to Yugoslavia, registered cover postmarked Asuncion (Paraguay) April 11, 1934 addressed to Dubrovnic (Yugoslavia) with arrival b/s April 24 and transit b/s Paris April 23. 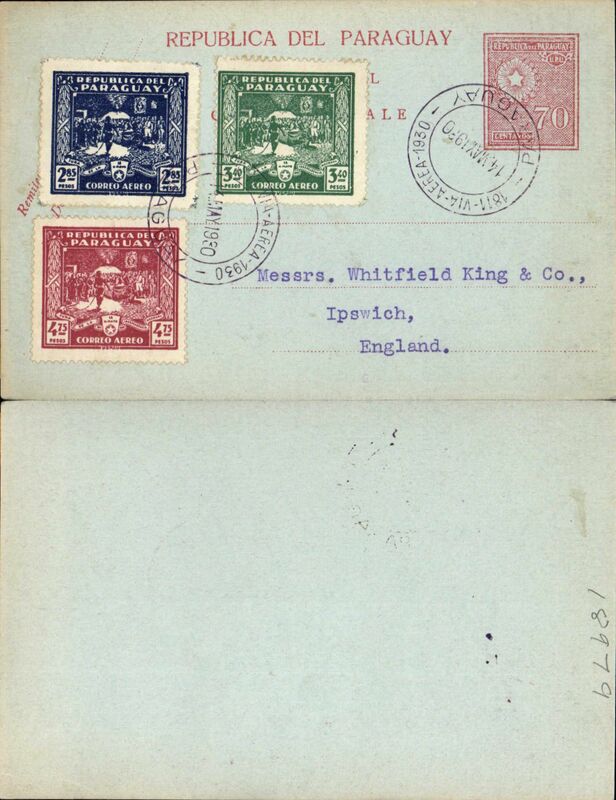 Attractive franking (but some stamps with faults). A little soiled and worn but an uncommon destination for an Aeropostale cover. Cover sent from Asuncion (Paraguay) postmarked June 26, 1936 to Manchester (U.K.) with no arrival b/s but a Paris Avion transit b/s of July 6, 1936. Scarce Scott C100 (2 pairs) and C39. Even though the weekly 100% air service was inaugurated in January 1936, the shortage of planes prevented from offering a regular weekly service at least for the first few months of that year. 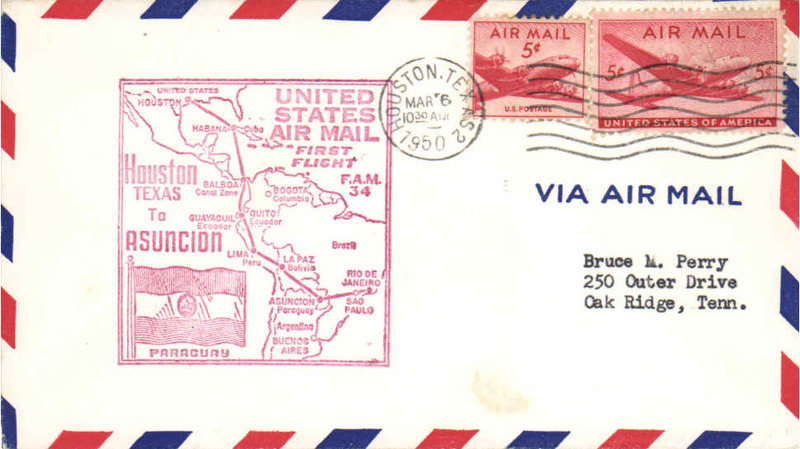 Return flights occurred on June 29 and July 14 so this cover, probably barely missing the June 29 flight, was sent by the old-fashion air-sea service which was still in operation to supplement the full-air service. 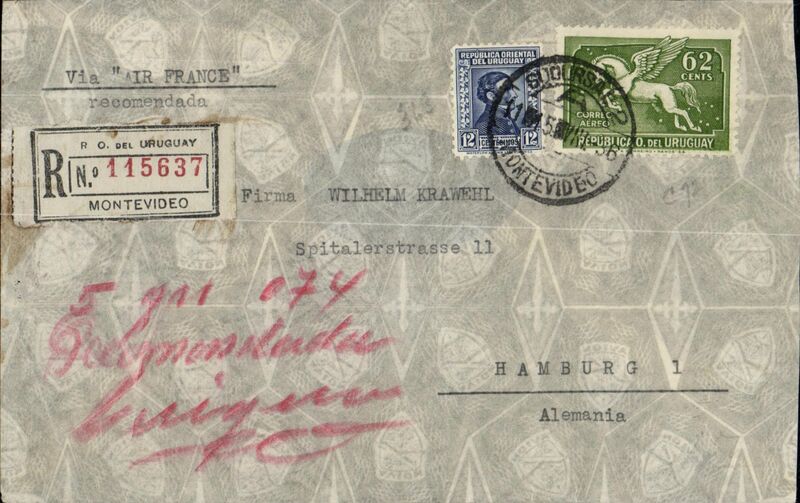 Registered cover from Montevideo (Uruguay) postmarked August 15, 1936 to Hamburg (Germany) with arrival b/s of August 25, neat non invasive oval excision verso (see scan). Even though the weekly 100% air service was inaugurated in January 1936, the shortage of planes prevented from offering a regular weekly service at least for the first few months of that year. Return flights occurred on August 18 and September 8th so this cover, barely missing the August 18th flight, was sent by the old-fashion air-sea service which was still in operation to supplement the full-air service. 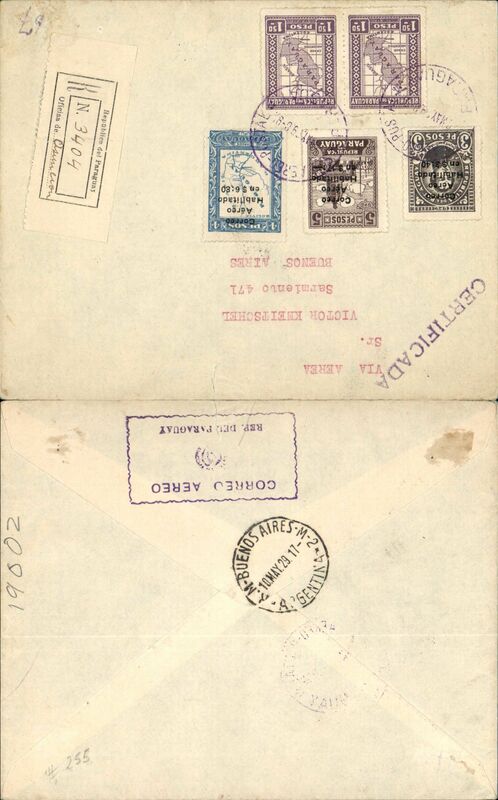 Registered (label verso) commercial air cover to Hamburg, 4/9 arrival ds on front, 'Stuttgart/Deutsche Luftpost Sudamerika-Europa/3.9.34' transit cds, fine strikes red circular 'Condor/Zeppelin/Lufthansa/Paraguay-Europa" x3, franked 31P50, flown 1/7 on DLH flight L 24 - last mid ocean landing/launch. See Graue and Duggan p188. South Atlantic. Re-establishment of an air service between Paraguay and Brazil, F/F FAM 10, Asucion to Rio, bs 28/12, franked 42P, attractive "waterfall" flight cachet, printed souvenir cover. Last flight under FAM 10 canopy, FAM 5 thereafter. Pan Am. Nice item. 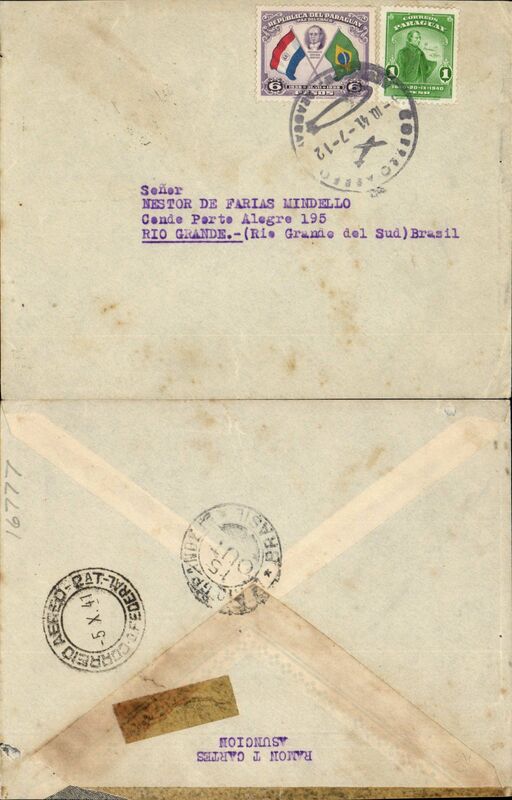 Re-establishment of an air service between Brazil and Paraguay, F/F FAM 10, Rio to Asuncion, bs 28/12, franked 1600 reis, and return Asuncion 3/1/38 to Rio, bs 7/1, franked 42.75p, attractive "waterfall" flight cachet, printed two way souvenir cover, both legs addressed to JT Trippe. Last flight under FAM 10 canopy, FAM 5 thereafter. Pan Am. Nice item. Asuncion to Rio de Janero, bs 21/8, registerd (label) flown cover franked 12P 60c ordinary and 1P 10c airs, tied by three black framed cachet announcing Estigarribia's appointment as President, postmarked "Correo Aereo/17/8/39/Asuncion-Paraguay" cds. Estigarribia was elected President for a four-year term in 1939, assuming office on August 15. 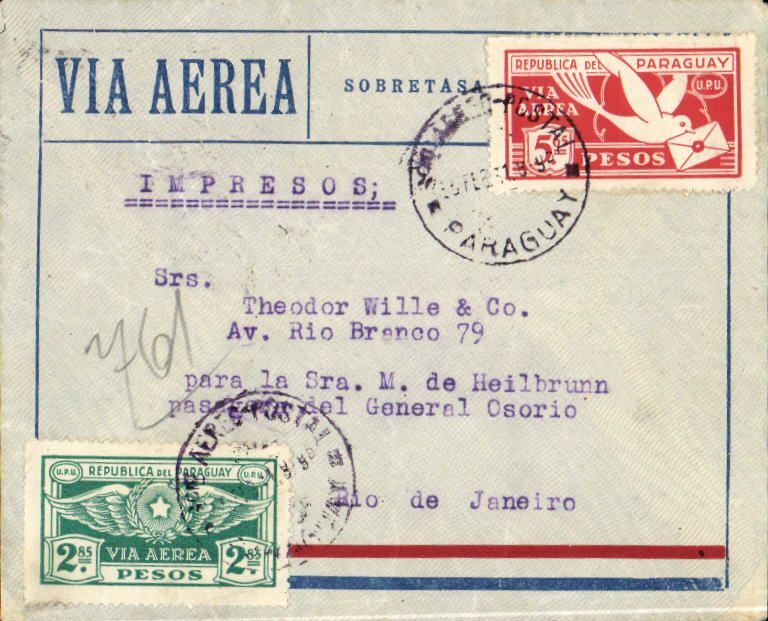 Registered cover from Asuncion with Correo Aereo postmark of August 17, 1939 to Rio de Janeiro with arrival b/s of August 21. Boxed cachet of sender Paraguay President Josef Estigarribia. Great franking which takes up most of the front of the cover: Scott 324, 336, 346, C22 (block of 4), C59, C62, C63 and C73 (pair). Nice item. Second regular northbound flight, first acceptance from Paraguay. 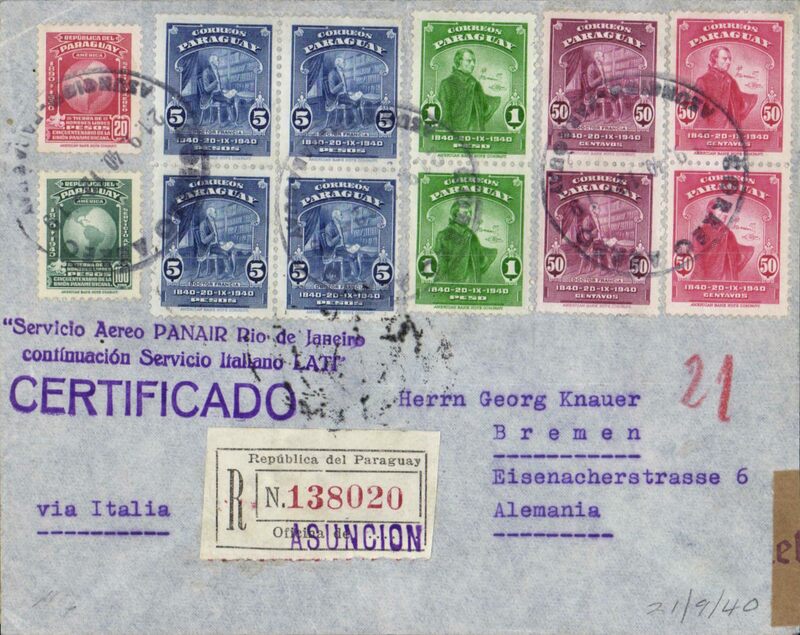 Registered (label) cover from Asuncion to Bremen, b/s 3/1/40, franked 232p, exceptionally fine violet "Servicio Aero PANAIR Rio de Janeiro continuacion Servicio Italiano LATI" cachet, dispatched Dec 21 to connect with Dec 30 LATI 2nd regular northbound flight from Brazil #SM83 flown by Capt. Paradisi/Biseo in plane 1-ATOS. 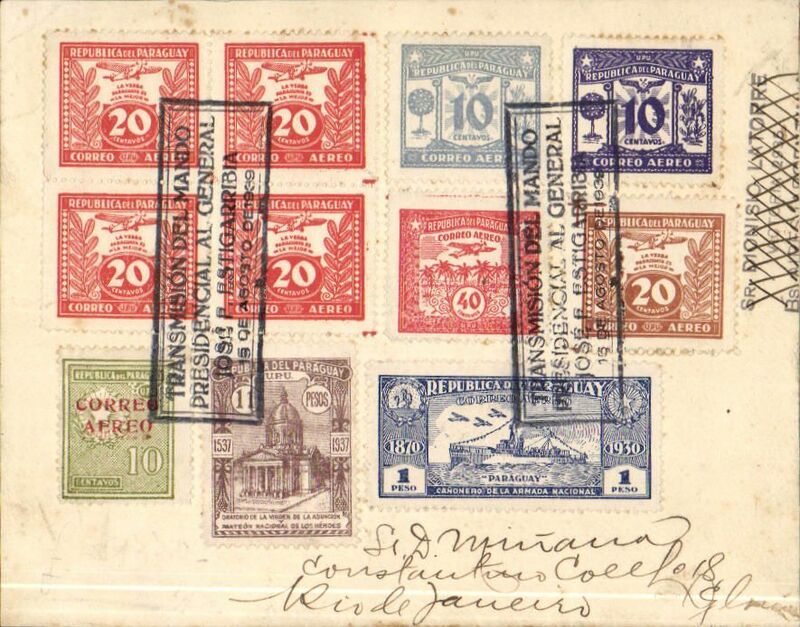 "Mail from Paraguay to Germany uncommon" see Beith p 36 also cover from same correspondence p 31. Paraguay to Argentina, Pan Am/Panagra uncensored WWII red/blue/grey company registered (label) airmail cover, Asuncion to Buenos Aires, black circular '476/Certificados/Central' registered mail reception of Buenos Aires Main Post Office verso, franked 41P, canc Correo Aereo/Asuncion Paraguay/25-1-40' cds. 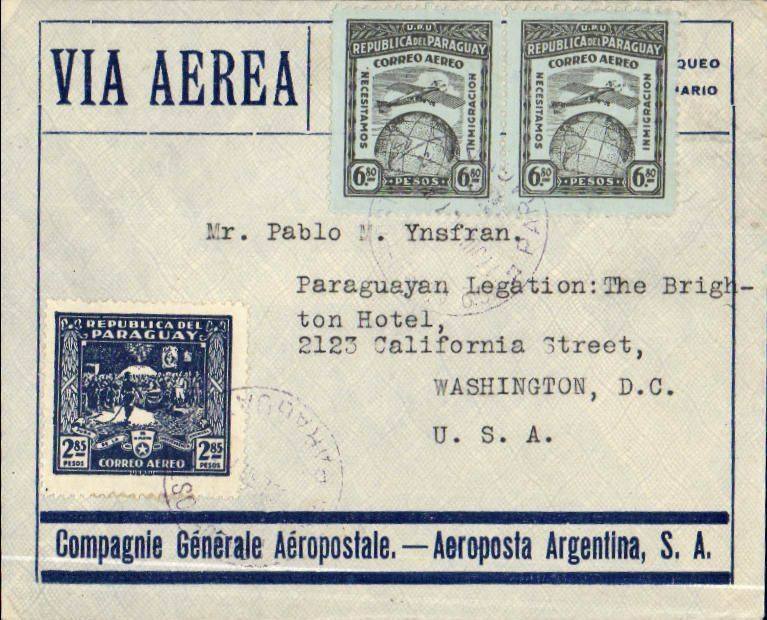 Both LATI and Air France carried mail from Paraguay to Europe until July 1940, via Pan Am?Panagra to Buenos Aires. A useful LATI collateral item. LATI registered World War II censored cover from Asuncion to Bremen, b/s 6/10/40, franked 144p, exceptionally fine violet "Servicio Aero PANAIR Rio de Janeiro continuacion Servicio Italiano LATI" cachet, "Via Italia" typed endorsement, dispatched Sep 21 to connect with Sep 28 northbound flight #SM83 from Brazil, flown by pilot Capt. Pavia in plane 1-AZUR, Frankfurt OKW censor seal. 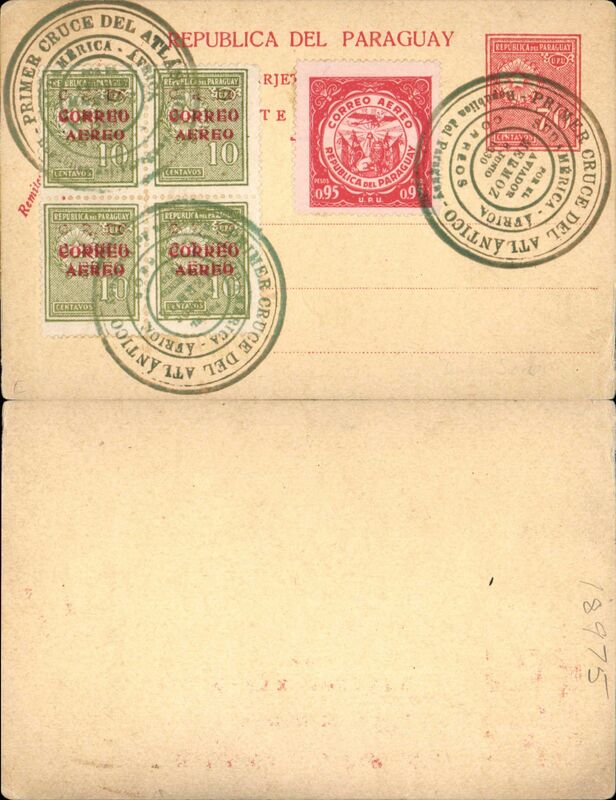 Northbound LATI mail from Paraguay is scarce. See Beith p 31 for an illustration of a cover from same correspondence. Superb LATI item. 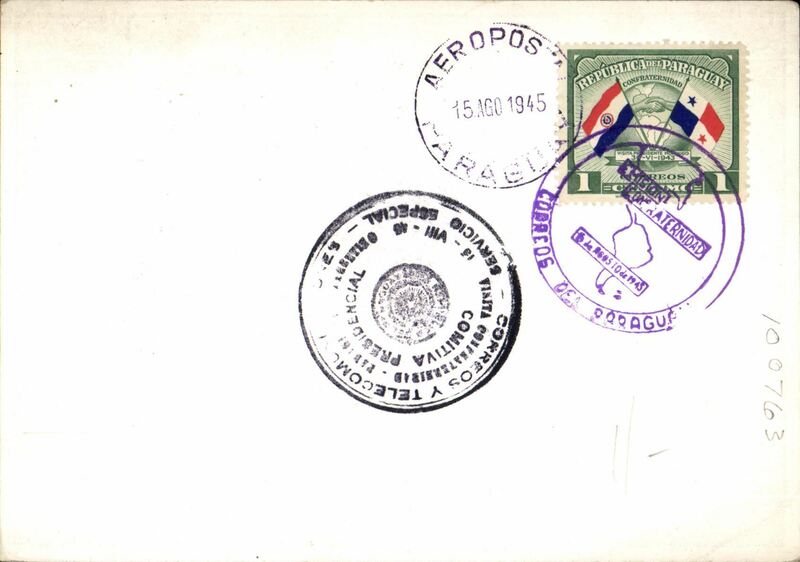 Paraguay to Brazil, Panair Do Brasil uncensored WWII plain cover, Asuncion to Porte Alegre, bs 15/10, franked 7P, canc Correo Aereo/Asuncion Paraguay/8-10-41' cds. 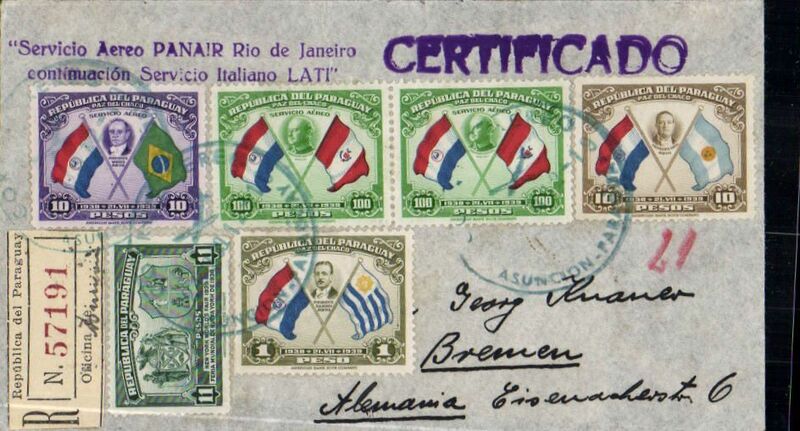 LATI and Air France carried mail from Paraguay to Europe until July 1940, and LATI until December 1940, via Pan Am/ Panair Do Brasil to Rio de Janero. A useful LATI collateral item. Paraguay Fellowship Congress 1945, multicoloured Souvenir PPC canc Paraguay/Aerpost cds and special Congress cachet.Small scuff on bottom edge of picture side. 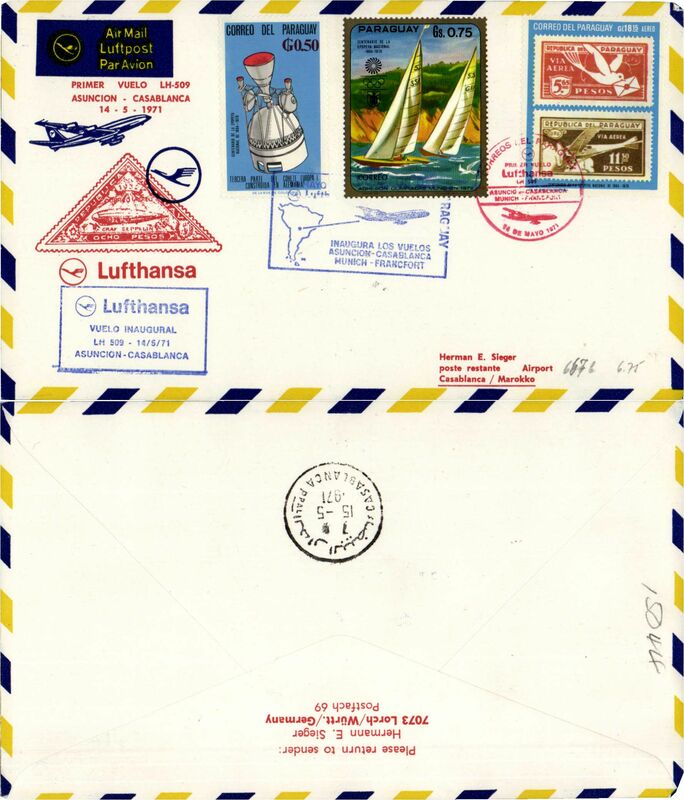 Lufthansa F/F, Asuncion-Casablanca, b/s, cachet, souvenir cover.